Welcome. These painting represent a selection of the past five years. 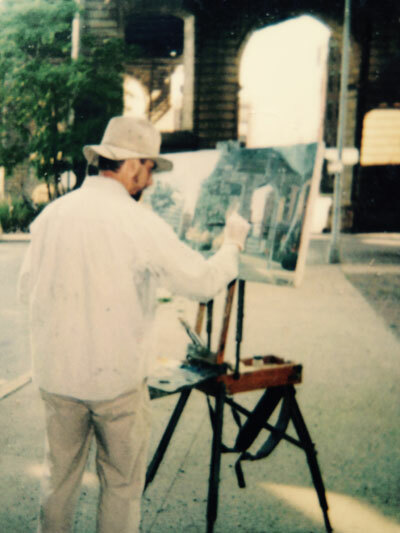 Presently working in the Yonkers’ vicinity, he began looking at the neighborhoods of Brooklyn in the late 70’s. The format of neighborhoods and Manhattan skylines comprised his main interests. The exchange of the specific foreground, the Brooklyn neighborhood, the general background, and the Manhattan skyline, generate a narrative which stimulated the artist. These works are the main enterprise of his career. The city offers the viewer the possibility to examine and consider the relationship of personal experiences and the larger formats created by our accumulated efforts. The questions of good or bad are proffered without prejudice. Nature, contained behind the fences of manufactured needs, is treated with the same concern and care as that of the wild wildernesses of the nineteenth century painters. Semergieff contrives to elicit a light that encourages reflection. The color builds the light inviting us to make this mental tour of our visual experience. His sources for these works invoke Edward Hopper, Albert Cuyp, Rackstraw Downes and, more recently, Antonio Lopez. In the recent works there has been an inverse exchange of man made elements to nature, where nature now comprises a larger proportion of attention – perhaps suggesting the true scale of human endeavors to those of nature.